It’s that time of the year again when the sun in all its blazing glory is determined to make our lives difficult. The summers are in full swing and in spite of living in the gastronomical paradise that Lucknow is, there is only so much comfort that the scrumptious local delicacies can give you. If, during the winters, we can gorge on the delicious makkhan malai, gajar ka halwa and Kashmiri chai; summers are a time to go easy on the food and brings in the wholesome goodness of watermelons, mangoes, wood apples and what not. While there’s hardly anything we can do to avoid the sweltering heat, why not make the most of the season and treat ourselves with some desi deliciousness. Made from seasonal fruits and spices, these traditional drinks will not only help you remain cool but have a myriad of other health benefits as well. Raw mangoes are much loved in all their forms and are quite a handy ingredient in households. From chutneys to desserts; they are used to prepare all sorts of dishes. One of the most common and refreshing ways to consume them is the delicious aam panna. This tangy concoction, known for its heat-resistant properties is prepared with raw mangoes, a variety of spices and sugar or jaggery. Perfect for the Indian summers, aam panna satiates thirst and counters the loss of salt and iron due to excessive sweating and is loaded with vitamin B1, B2, niacin and vitamin C.
Native to India, the bel fruit is also known as stone apple or wood apple. It is a hard skinned, pulpy fruit and like the aam panna, it has immense cooling properties along with a host of other health benefits. The drink is quite similar to the Aam panna in its preparation as well and is made using spices like cumin powder and cardamom powder along with jaggery/sugar and salt. Watermelon juice should be on you must-have list for this summer. Loaded with minerals, anti-oxidants and vitamins, watermelons are made up of 95% water, which means they are extremely hydrating and are low in calories so you won’t feel guilty consuming them even if you are on a diet. Also, they are great for cardiovascular health and anti-ageing. Prepared with a dash of black salt and pepper, chilled watermelon juice is all you need to stay cool this summer! The old-style lemonade is made from ingredients like lemon or lime juice, sugar and ice and is a staple in many Indian households. 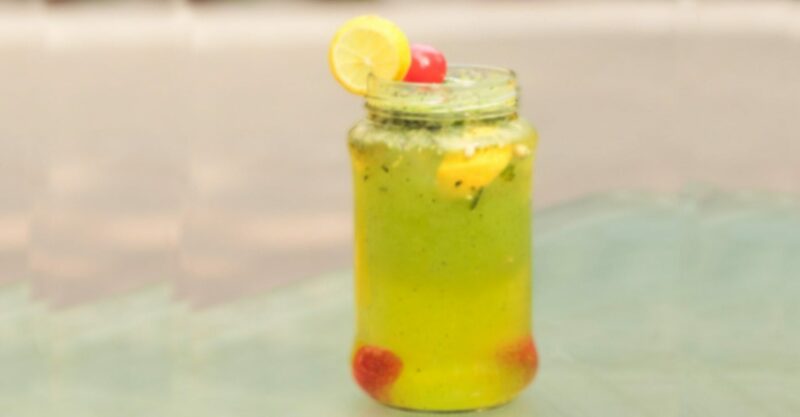 Who can forget the childhood days when one would return from school in the scorching heat only to find that chilled glass of lemony goodness waiting for us? The modest nimbu pani is also often prepared with a twist using mint, saffron, salt, ginger and cumin. One can easily sight the very many carts carrying matkas or clay-pots decorated with lemons lining up the streets of Lucknow. Sometimes a tall glass of chilled yogurt blended with water and dry fruits is all you need to beat the summer woes. The luscious lassi can be sweet, salty, plain or with dry fruits. Since it is made with yogurt, it is not just cooling but is also a probiotic with lots of calcium which makes it great for digestive and bone health. Mango lassi has become quite the trend in countries like Sri Lanka, UK and Singapore and honestly we’re not surprised. After all, mango and yogurt make for a heavenly combination. Mattha or butter milk, on the other hand, is a beverage made with yogurt and mixed spices. It is perfect to be consumed with a meal and due to its healing properties and versatility, it is used to cook a range of curries and other dishes. The best part about these summer beverages is that they are prepared using fresh ingredients like seasonal fruits and can even be easily made at home. For those who don’t want to go through that hassle, there are numerous places in Lucknow that offer these delicious drinks. For the lassi and mattha, we highly recommend checking out the areas in old Lucknow such as Chowk and Ameenabad. If you can’t go that far, don’t fret. Look around and find a crowded stall, you know where to go. Do let us know in comments or on our Facebook post about the places that serve delightful stuff from our list.